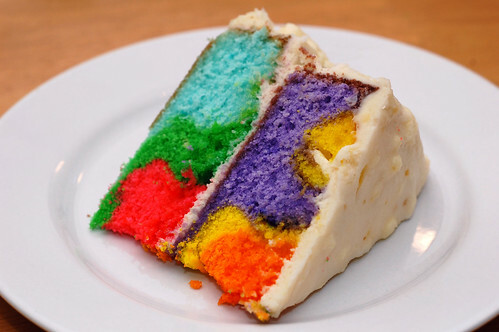 Edible Art – Rainbow Cake! As Heather mentioned yesterday, we’re going to be adding some new kinds of content to the site. There are other aspects of the cooking/baking/food that we love and we want to share that with you. One of the new sections is food photography, where we share some awesome beauty in edible form. As always, we welcome your feedback. Tell us what you think of the new features and let us know if there’s something you’d like to see. UPDATE: We got a flurry of interest in this cake and decided to run a RAINBOW WEEK theme. You can check out it out by clicking here for tips on how to make your own cake as well as other ideas you can do with the rainbow theme. Enjoy! We’ve had a couple readers who were following our twitter posts already try it out themselves. If you do the same, be sure to share it with us! – Kelly took great shots during the various stages of the process. – Stephanie rocked this as well. « How About A Little Kahlua Pie With Your Inauguration Day? Wow. Now that looks like something I want to make for my baby’s birthday. Please post the how-do asap!! P.S. I’ve made just about 1/2 the things on this blog – I realized this weekend. You two are amazing. Definitely a kid friendly idea (or hippy friendly, perhaps?). Instructions will be up soon! Glad you like the recipes. We’ll have to do a “reader’s favorites’ thing some day. I just love your blog and I love trying your recipes. The photography is great but please please please don’t keep us in suspense. Please show us how to make this incredible cake. I have got to make this one right now. It is too cool for words. Commenters – there’s a how-to at the Omnomicon link! Not to self-promote or anything . . .